This article is about the Roman sun god. For other uses of Sol Invictus, see Sol Invictus (disambiguation). 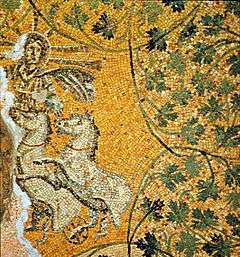 Sol Invictus ("Unconquered Sun") was the official sun god of the later Roman Empire and a patron of soldiers. In 274 AD the Roman emperor Aurelian made it an official cult alongside the traditional Roman cults. Scholars disagree about whether the new deity was a refoundation of the ancient Latin cult of Sol, a revival of the cult of Elagabalus or completely new. The god was favored by emperors after Aurelian and appeared on their coins until Constantine I. The last inscription referring to Sol Invictus dates to AD 387, and there were enough devotees in the 5th century that Augustine found it necessary to preach against them. The theory dating from the 12th century, that the near-solstice date of 25 December for Christmas was selected because it was the date of the Roman festival of Dies Natalis Solis Invicti (Birthday of the Unconquered Sun) is challenged by some Christian scholars. Different explanations for the date similarity are considered to be "academically thoroughly viable hypotheses" by some. Both theories have supporters, with some claiming that the festival of Dies Natalis Solis Invicti was later syncretized with Christmas and others saying that the Christian celebration may predate the festival of the Dies Natalis Solis Invicti. Invictus ("Unconquered, Invincible") was an epithet for several deities of classical Roman religion, including the supreme deity Jupiter, the war god Mars, Hercules, Apollo, and Silvanus. It had been in use from the 3rd century BC. The Roman cult to Sol is continuous from the "earliest history" of the city until the institution of Christianity as the exclusive state religion. Scholars have sometimes regarded the traditional Sol and Sol Invictus as two separate deities, but the rejection of this view by S. E. Hijmans has found supporters. An inscription of AD 102 records a restoration of a portico of Sol in what is now the Trastevere area of Rome by a certain Gaius Iulius Anicetus. While he may perhaps have had in mind an allusion to his own cognomen, which is the Latinized form of the Greek equivalent of invictus, ἀνίκητος (aniketos), the earliest extant dated inscription that uses invictus as an epithet of Sol is from AD 158. Another, stylistically dated to the 2nd century, is inscribed on a Roman phalera (ornamental disk): inventori lucis soli invicto augusto ("to the contriver of light, sol invictus augustus"). Augustus is a regular epithet linking deities to the Imperial cult. Sol Invictus played a prominent role in the Mithraic mysteries, and was equated with Mithras himself. The relation of the Mithraic Sol Invictus to the public cult of the deity with the same name is unclear and perhaps non-existent. According to the Historia Augusta, Elagabalus, the teenaged Severan heir, adopted the name of his deity and brought his cult image from Emesa to Rome. Once installed as emperor, he neglected Rome's traditional State deities and promoted his own as Rome's most powerful deity. This ended with his murder in 222. The Historia Augusta refers to the deity Elagabalus as "also called Jupiter and Sol" (fuit autem Heliogabali vel Iovis vel Solis). While this has been seen as an attempt to import the Syrian sun god to Rome, the Roman cult of Sol had existed in Rome in the earlier Republic. The Roman gens Aurelia was associated with the cult of Sol. After his victories in the East, the Emperor Aurelian thoroughly reformed the Roman cult of Sol, elevating the sun-god to one of the premier divinities of the Empire. Where previously priests of Sol had been simply sacerdotes and tended to belong to lower ranks of Roman society, they were now pontifices and members of the new college of pontifices instituted by Aurelian. Every pontifex of Sol was a member of the senatorial elite, indicating that the priesthood of Sol was now highly prestigious. Almost all these senators held other priesthoods as well, however, and some of these other priesthoods take precedence in the inscriptions in which they are listed, suggesting that they were considered more prestigious than the priesthood of Sol. Aurelian also built a new temple for Sol, bringing the total number of temples for the god in Rome to (at least) four. He also instituted games in honor of the sun god, held every four years from a.d. 274 onwards. The identity of Aurelian's Sol Invictus has long been a subject of scholarly debate. Based on the Augustan History, some scholars have argued that it was based on Sol Elagablus (or Elagabla) of Emesa. Others, basing their argument on Zosimus, suggest that it was based on the Šams, the solar god of Palmyra on the grounds that Aurelian placed and consecrated a cult statue of the sun god looted from Palmyra in the temple of Sol Invictus. Professor Gary Forsythe discusses these arguments and adds a third more recent one based on the work of Steven Hijmans. Hijmans argues that Aurelian's solar deity was simply the traditional Greco-Roman Sol Invictus. On the venerable day of the Sun let the magistrates and people residing in cities rest, and let all workshops be closed. In the country however persons engaged in agriculture may freely and lawfully continue their pursuits because it often happens that another day is not suitable for grain-sowing or vine planting; lest by neglecting the proper moment for such operations the bounty of heaven should be lost. Constantine's triumphal arch was carefully positioned to align with the colossal statue of Sol by the Colosseum, so that Sol formed the dominant backdrop when seen from the direction of the main approach towards the arch. Berrens deals with coin-evidence of Imperial connection to the Solar cult. Sol is depicted sporadically on imperial coins in the 1st and 2nd centuries AD, then more frequently from Septimius Severus onwards until AD 325/6. Sol invictus appears on coin legends from AD 261, well before the reign of Aurelian. Connections between the imperial radiate crown and the cult of Sol are postulated. Augustus was posthumously depicted with radiate crown, as were living emperors from Nero (after AD 65) to Constantine. Some modern scholarship interprets the imperial radiate crown as a divine, solar association rather than an overt symbol of Sol; Bergmann calls it a pseudo-object designed to disguise the divine and solar connotations that would otherwise be politically controversial but there is broad agreement that coin-images showing the imperial radiate crown are stylistically distinct from those of the solar crown of rays; the imperial radiate crown is depicted as a real object rather than as symbolic light. Hijmans argues that the Imperial radiate crown represents the honorary wreath awarded to Augustus, perhaps posthumously, to commemorate his victory at the battle of Actium; he points out that henceforth, living emperors were depicted with radiate crowns, but state divi were not. To Hijmans this implies the radiate crown of living emperors as a link to Augustus. His successors automatically inherited (or sometimes acquired) the same offices and honours due to Octavian as "saviour of the Republic" through his victory at Actium, piously attributed to Apollo-Helios. Wreaths awarded to victors at the Actian Games were radiate. The Philocalian calendar of AD 354 gives a festival of "Natalis Invicti" on 25 December. There is limited evidence that this festival was celebrated before the mid-4th century. The idea that Christians chose to celebrate the birth of Jesus on 25 December because this was the date of an already existing festival of the Sol Invictus was expressed in an annotation to a manuscript of a work by 12th-century Syrian bishop Jacob Bar-Salibi. The scribe who added it wrote: "It was a custom of the Pagans to celebrate on the same 25 December the birthday of the Sun, at which they kindled lights in token of festivity. In these solemnities and revelries the Christians also took part. Accordingly when the doctors of the Church perceived that the Christians had a leaning to this festival, they took counsel and resolved that the true Nativity should be solemnised on that day." This idea became popular especially in the 18th and 19th centuries. In the 20th century, however, the view that Christmas was set by the date of Dies Natalis Solis Invicti has been challenged by some scholars. According to a discussion from the Church of England, for example, "On this question there are two schools of thought. The older view is that these two dates represent christian adaptation of the respective winter solstice dates in the West and East, which were already important pagan festivals. Those who hold this view cite the celebrations connected with Apollo, Mithras and Dionysius with their themes of birth and rebirth, and the coming of the deity to dwell with his followers. In Rome by 274 AD the Winter solstice was a public holiday in honour of Sol Invictus, the unconquered sun.... Although this view is still very common, it has been seriously challenged by what may be called the 'Calculation' theory." The calculation refers to an alternate derivation of the date of Christmas based on an old tradition according to which the date of Christmas was fixed at nine months after 25 March, the date of the vernal equinox, on which the Annunciation was celebrated. The Jewish calendar date of 14 Nisan was believed to be that of creation, as well as of the Exodus and so of Passover, and Christians held that the new creation, both the death of Jesus and the beginning of his human life, occurred on the same date, which some put at 25 March in the Julian calendar. It was a traditional Jewish belief that great men lived a whole number of years, without fractions, so that Jesus was considered to have been conceived on 25 March, as he died on 25 March, which was calculated to have coincided with 14 Nisan. Sextus Julius Africanus (c. 160 – c. 240) gave 25 March as the day of creation and of the conception of Jesus. The tractate De solstitia et aequinoctia conceptionis et nativitatis Domini nostri Iesu Christi et Iohannis Baptistae falsely attributed to John Chrysostom also argued that Jesus was conceived and crucified on the same day of the year and calculated this as 25 March. A passage of the Commentary on the prophet Daniel by Hippolytus of Rome, written in about 204, has also been appealed to. This view was proposed by Louis Duchesne, and argued by Thomas J. Talley, David J. Rothenberg, J. Neil Alexander, and Hugh Wybrew. The Oxford Companion to Christian Thought lists both theories for the origin of Christmas, and also remarks on the uncertainty about the order of precedence between the celebrations of the Birthday of the Unconquered Sun and the birthday of Jesus: "This 'calculations' hypothesis potentially establishes 25 December as a Christian festival before Aurelian's decree, which, when promulgated, might have provided for the Christian feast both opportunity and challenge." Susan K. Roll calls "most extreme" the unproven hypothesis that "would call Christmas point-blank a 'christianization' of Natalis Solis Invicti, a direct conscious appropriation of the pre-Christian feast, arbitrarily placed on the same calendar date, assimilating and adapting some of its cosmic symbolism and abruptly usurping any lingering habitual loyalty that newly-converted Christians might feel to the feasts of the state gods". The nimbus of the figure under Saint Peter's Basilica is described by some as rayed, as in traditional pre-Christian representations, but another has said: "Only the cross-shaped nimbus makes the Christian significance apparent" (emphasis added). Yet another has interpreted the figure as a representation of the sun with no explicit religious reference whatever, pagan or Christian. 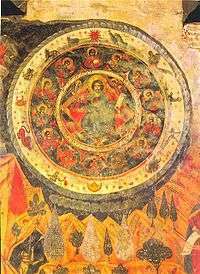 A 17th-century fresco from the Cathedral of Living Pillar in Georgia depicting Jesus within a circle of angels and an outer circle with the Zodiac and a thirteenth sign. The comparison of Christ with the astronomical Sun is common in ancient Christian writings. In the 5th century, Pope Leo I (the Great) spoke in several sermons on the Feast of the Nativity of how the celebration of Christ's birth coincided with increase of the sun's position in the sky. An example is: "But this Nativity which is to be adored in heaven and on earth is suggested to us by no day more than this when, with the early light still shedding its rays on nature, there is borne in upon our senses the brightness of this wondrous mystery." Jesus as a "sun god"
The halo of Jesus, seen in many paintings, has similarities to the zodiac cross. One theory connects the biblical elements of Christ's life to those of a sun god. According to the scriptures, Jesus had 12 followers or "disciples", which is akin to the twelve zodiac constellations. When the sun was in the house of Scorpio, Judas plotted with the chief priests and elders to arrest Jesus by kissing him. As the sun exited Libra, it enters into the waiting arms of Scorpio to be kissed by Scorpio's bite. Many of the world's sacrificed godmen have their traditional birthday on December 25. During this time, people believed that the "sun god" had "died" for three days and was "born again" on December 25. After December 25, the Sun moves 1 degree, this time north, foreshadowing longer days. The three days following December 21 remain the darkest days of the year where Jesus (the sun) dies and remains unseen for three days. 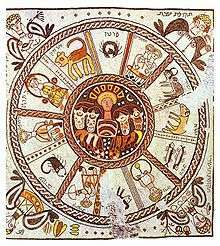 The traditional image of the sun is used also in Jewish art. A mosaic floor in Hamat Tiberias presents David as Helios surrounded by a ring with the signs of the zodiac. As well as in Hamat Tiberias, figures of Helios or Sol Invictus also appear in several of the very few surviving schemes of decoration surviving from Late Antique synagogues, including Beth Alpha, Husefa, all now in Israel, and Naaran in the West Bank. He is shown in floor mosaics, with the usual radiate halo, and sometimes in a quadriga, in the central roundel of a circular representation of the zodiac or the seasons. These combinations "may have represented to an agricultural Jewish community the perpetuation of the annual cycle of the universe or ... the central part of a calendar". ↑ Hijmans (2009, pp. Chapter 1) (a reworking of Hijmans, 1996; Matern, 2001; Wallraff, 2002; and Berrens, 2004; all follow Hijmans. ↑ CIL VI, 715: Soli Invicto deo / ex voto suscepto / accepta missione / honesta ex nume/ro eq(uitum) sing(ularium) Aug(usti) P(ublius) / Aelius Amandus / d(e)d(icavit) Tertullo et / Sacerdoti co(n)s(ulibus) (Publius Aelius Amandus dedicated this to the god Sol Invictus in accordance with the vow he had made, upon his honorable discharge from the equestrian guard of the emperor, during the consulship of Tertullus and Sacerdos); see: Campbell, J. (1994). The Roman army, 31 BC–AD 337: a sourcebook, p. 43; Halsberghe 1972, p. 45. ↑ An illustration is provided in Kantorowicz, E. H. (1961). Gods in Uniform, 368–393, 383, fig. 34 Proceedings of the American Philosophical Society, 105(4), (August 1961). ↑ Ulansey, David. (1989). The Origins of the Mithraic Mysteries, p. 107. Oxford University Press. ↑ Salzman, Michele Renee. (2004). Pagan and Christian Notions of the Week in the 4th Century CE Western Roman Empire In Time and Temporality in the Ancient World, p. 192. University of Pennsylvania Museum of Archaeology and Anthropology. ↑ Alvar, Jaime, tr. Gordon, Richard (2008). Romanising Oriental Gods: Myth, Salvation, and Ethics in the Cults of Cybele, Isis, and Mithras, p. 100. Brill. ↑ Hijmans 1996, Matern 2001, Wallraff 2002, Berrens 2004, Hijmans (2009)). ↑ J.C. Richard, “Le culte de Sol et les Aurelii: À propos de Paul Fest. p. 22 L.”, in Mélanges offerts à Jacques Heurgon: L'Italie préromaine et la Rome républicaine (Rome, 1976), 915–925. ↑ For a full list of the pontifices of Sol see J. Rupke (ed. ), Fasti Sacerdotum (2005), p. 606. Memmius Vitrasius Orfitus lists his priesthoods as pontifex of Vesta, one of the quindecimviri sacris faciundis, and pontifex of Sol, in that order (Corpus Inscriptionum Latinarum vol. 6, 1739–1742). In a list of eight priesthoods, Vettius Agorius Praetextatus puts Pontifex Solis in third place (CIL VI, 1779). ↑ Dirven, Lucinda (1999). The Palmyrenes of Dura-Europos: A Study of Religious Interaction in Roman Syria. BRILL. p. 169. ISBN 978-9004115897. ↑ Forsythe, Gary (2012). Time in Roman Religion: One Thousand Years of Religious History. Routledge. pp. 142–143. ISBN 978-0415522175. ↑ E. Marlowe, “Framing the sun. The Arch of Constantine and the Roman cityscape”, Art Bulletin 88 (2006) 223–242. ↑ S. Berrens, Sonnenkult und Kaisertum von den Severern bis zu Constantin I. (193–337 n. Chr.) Stuttgart: Steiner 2004 (Historia-Einzelschriften 185). ↑ Berrens 2004, precise p. number to follow. The coinage Elagabalus does not use invictus for Roman Sol, nor the Emesan Solar deity Elagabalus. ↑ Bergmann 1998, 116–117; Hijmans 2009, 82–83. ↑ Hijmans 2009, 509–548. A mosaic floor in the Baths of the Porta Marina at Ostia depicts a radiate victory crown on a table as well as a victorious competitor wearing one. ↑ Wallraff 2001: 174–177. Hoey (1939: 480) writes: "An inscription of unique interest from the reign of Licinius embodies the official prescription for the annual celebration by his army of a festival of Sol Invictus on December 19". The inscription (Dessau, Inscriptiones Latinae Selectae 8940) actually prescribes an annual offering to Sol on November 18 (die XIV Kal(endis) Decemb(ribus), i.e., on the fourteenth day before the Kalends of December). ↑ Text at Parts 6 and 12 respectively. ↑ Sir Edward Burnett Tylor, Researches Into the Development of Mythology, Philosophy, Religion, Art, and Custom, Volume 2, p. 270; John Murray, London, 1871; revised edition 1889. ↑ Philip Schaff, History of the Christian Church, Volume 3, 1885, T and T Clark, Edinburgh, page 396; see also Volume 4 in the 3rd edition, 1910 (Charles Scribner's Sons, NY). 1 2 Oxford Dictionary of the Christian Church (Oxford University Press 2005 ISBN 978-0-19-280290-3), article "Christmas"
↑ See discussion in the Talmud (Avraham Yaakov Finkel, Ein Yaakov (Jason Aronson 1999 ISBN 978-1-46162824-8), pp. 240–241), and Aryeh Kaplan's chapter, "The Shofar of Mercy", on the apparent contradiction between that tradition and the Jewish celebration of creation on 1 Tishrei. 1 2 Weitzmann, Kurt (1979). Age of Spirituality. Metropolitan Museum of Art. p. 522. ISBN 978-0-87099179-0. ↑ Nicholas Campion, The Book of World Horoscopes, The Wessex Astrologer, 1999, p. 489 clearly refers to both conventions adopted by many astrologers basing the Ages on either the zodiacal constellations or the sidereal signs. Wikimedia Commons has media related to Sol Invictus.